Established January 27, 2015, Rock and Rolls Sushi Lounge is located on Padre Island where the casual way of life is highly embraced but an intimate dining experience is also appreciated. With this in mind, owner and Chef David Lee has centered Rock and Rolls Sushi Lounge’s atmosphere around great food and good times. Owner and Chef David Lee has been in the restaurant business since sixteen years old and is certainly no stranger to Asian cuisine. His grandfather,Du Lit Lee, opened the first Chinese restaurant in Corpus Christi back in the early 1950’s. David Lee was inspired to follow in his grandfather’s footsteps and entered the restaurant business as well and has since successfully opened another restaurant called Mudbugs Cajun Icehouse on south-side Corpus Christi. 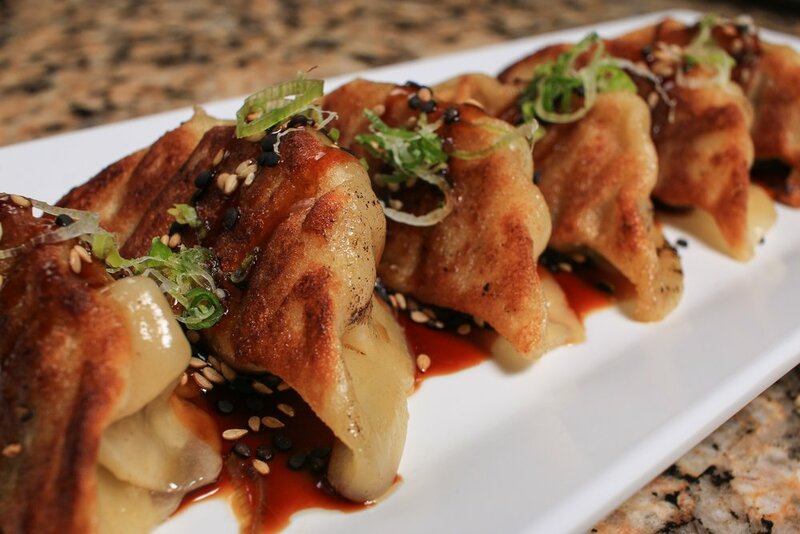 Rock and Rolls Sushi’s cuisine offers an Asian fusion flavor with a South Texas flare. All fresh fish is flown from Hawaii and combined with the freshest fruits, herbs, and peppers to create a unique flavor combination found solely at Rock and Rolls Sushi Lounge. We invite you to join us for a one of kind sushi experience and for memories to be mad that will last a life time. 15121 S. Padre Island Dr.
With leaf lettuce, sweet pickled carrot, cucumber, and grapes wrapped in a Vietnamese spring roll. Sashimi grade New Zealand King Salmon with lettuce, avocado, cucumber, sweet carrot, and a cilantro chimichurri. Sweet and spicy tuna with leaf lettuce, katsu krab, cilantro, mint, pickled carrots and avocado. Togarashi and black pepper seared tuna over a cucumber and scallion salad with a basil tomato ponzu. Sashimi style yellowtail over our house made ponzu topped with mango, jalapeño, cilantro and crunchy garlic with chili oil. Sashimi grade salmon mixed with green apple, avocado, cilantro, goat cheese, and fried garlic. Served with shrimp chips. Southern Bluefin tuna sashimi topped with strawberries, sweet chili, spicy mayo, goat cheese, fried garlic, and scallions. Over a pineapple ponzu, topped with fried garlic and scallions. Topped with sweet chili, yuzu and serrano peppers with a touch of spicy mayo. Choice of strawberry with avocado, fried garlic, and basil. Or mango with avocado, fried garlic and cilantro. Served with shrimp chips. Snapper sashimi over a tamarind cashew sauce served with mango coulis, crunchy garlic and cilantro. Miso soup mixed with yuzu, sriracha, sambal, cilantro, and jalapeño. Choice of: Kosher salt, black truffle sea salt, or grilled with garlic and cracked black pepper. Fried or steamed then pan seared. Served with eel or sweet chili sauce. Wagyu flank that is marinated in a tomato and basil infused shoyu (soy sauce), then torched and topped with jalapeños, goat cheese and fried garlic. Braised in Japanese beer then pan fried with a Korean BBQ glaze served with balsamic cherry chutney and cilantro cream. Choice of katsu fried with spicy mayo, eel sauce, and scallions or spicy tempura fried with a pineapple ponzu. Tossed in a sweet and spicy cilantro sauce. Large Hass avocado stuffed with spicy crawfish and goat cheese baked with spicy mayo topped with eel sauce and tempura crunchies served with two spicy tempura fried shrimp. Served grilled with avocado, cilantro chimichurri, and mango pico de gallo or lightly tempura fried with cilantro cream, mango pico de gallo, and yuzu tarter sauce. Soft shell crab, cream cheese, jalapeño inside with smoked eel, blackened tuna, and avocado on top. Drizzled with spicy sauce and eel sauce. Krab and cream cheese inside topped with tuna, snapper, and krab baked in spicy sauce. Krab, cream cheese, and avocado topped with sweet and spicy tina tar tar and strawberry. Drizzled with sweet chili. Smoked salmon, cream cheese, and avocado tempura fried and topped with a spicy grab salad and eel sauce. Spicy tempura shrimp, cream cheese, and krab salad topped with seared tuna, avocado and tempura fried jalapeño rings. Grilled Wagyu beef, cucumber, and avocado topped with wasabi relish and scallions. 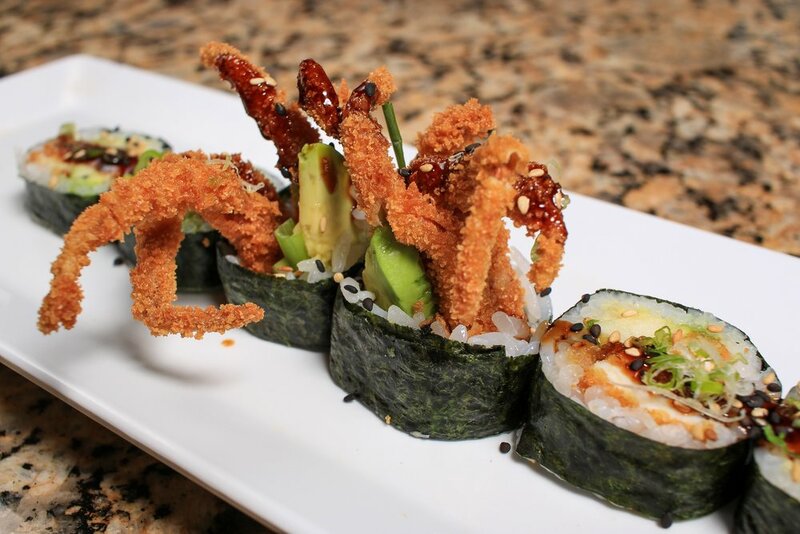 Katsu soft shell crab, avocado, and green apple. Served with eel sauce. Katsu jalapeno, cream cheese, wakame salad topped with avocado. Drizzled with sriracha, spicy mayo, and eel sauce. Yellowtail, cucumber, and mango topped with spicy tuna tar tar, avocado, spicy mayo, and tempura crunchies. Riceless roll with spicy tuna, krab, cream cheese, and jalapeño wrapped in nori then katsu fried with spicy mayo. Shrimp and cream cheese topped with salmon, avocado, spicy sauce, and scallions. Katsu fried eel, cream cheese, avocado, and jalapeño, topped with sweet and spicy krab salad and drizzled with eel sauce. Katsu fried shrimp and avocado, topped with salmon, spicy mayo, goat cheese, serrano peppers, sweet chili, and tempura crunchies. Tuna, cream cheese, and avocado spicy tempura fried, topped with jalapeños, spicy mayo and eel sauce dusted with ghost chili. Spicy tuna, cucumber, and cilantro, topped with yellowtail, mango, scallions, and drizzled with yuzu miso glaze. Cream cheese, spicy tuna tar tar and jalapenos, topped with tempura fried eel, spicy mayo, eel sauce and lightly sprinkled with smoked eel. Blackened tuna, cream cheese, mango, avocado, mint and cilantro over garlic chili sauce. Krab and cucumber topped with tuna, salmon, and avocado. Spicy tuna topped with spicy mayo. Nigiri 1pc/ Sashimi 2pc All Nigiri is served with a house shoyu (soy) and wasabi relish. Four pieces chef's choice of our finest and freshest product. Ice cream wrapped in sponge cake tempura fried with strawberries, whip cream, and dark chocolate almond crumbles. A rich chocolate cake filled with chocolate mousse and covered in chocolate ganache. Midly sweet with a hint of honey and green tea. A mocha flavored cheesecake topped with a dark chocolate ganache. Toasted coconut and pineapple cheesecake with a rum and caramel sauce. Chocolate truffles covered in ganache topped with toasted coconut and pecans. Pecans, freshly zested oranges, and Woodford Reserve Bourbon in a short bread crust. Keke Lime and fresh key lime juice Florida style with a graham cracker crust. Choice of fresh cucumber juice or watermelon juice mixed with 1876 Vodka, lemon and mint. Garnished with a chili salt rim. Muddled strawberries, blueberries, lime and mint mixed with Flor de Cana Silver and Bacardi Dragon Berry and a splash of soda. 1876 Vodka mixed with our own signature Bloody Mary mix. Garnished with pickled green beans. Espolon Tequila mixed with Cointreau, fresh lime juice and agave nectar. 1800 Coconut Tequila (or Ciroc Coconut Vodka) and St. Germain mixed with fresh lemon juice and coconut water. Tanteo Jalapeno Tequila mixed with Cointreau, fresh lime juice, agave, and olive juice. Stoli Vodka mixed with Spectacular Q Ginger Beer and fresh lime juice. Choice of Strawberry, Blueberry, Raspberry, or Cherry with Deep Eddy Lemon and fresh lemon juice or Absolute Lime with fresh lime juice. Grey Goose Poire and St. Germain mixed with fresh lemon juice and simple syrup. Ciroc Apple Vodka, Grey Goose Poire, fresh lemon juice and a splash of simple syrup. Call (361) 949-1110 from 3pm – 10pm Tuesday-Sunday, to book a reservation with us. Reservations are highly recommended for parties of 6 or more.